It’s very fitting for Christy to be the first Radical Doula profile of 2013. Christy was one of the first doulas I met who was also involved in the reproductive justice movement, and I remember clearly a conversation we had in 2006 about the doula community and the difficulties of finding room for our politics. We even talked for a while about starting a Radical Doula website together, so Christy is very much a part of the origin story of this work. Without further ado, the fabulous Christy Hall. Christy Hall has been a birth doula for over a decade. During that time, she has also held various other titles including pregnancy options counselor, abortion counselor, childbirth educator, postpartum doula, student, and mother. In 2001, she was co-founder of The Prison Doula Project, based in Olympia Washington and worked with the group for many years. She now lives in Portland, Oregon with her partner and two daughters where she has a private doula practice and works with Calyx Doulas, a collective that provides full spectrum support. Visit her website for more information. It was my drive for social and cultural change that brought me into this work. I started off working with teen parents and pregnant people in prison out of my desire to make a positive impact in the lives of oppressed and invisible people. What I learned about pregnancy, birth and the emotional and informational needs of people through this time transformed me. I do doula work now because I truly believe it is my calling. I sincerely feel the importance of carrying the stories of so many people with me and aspire to be a positive force working for personal empowerment and and cultural change. 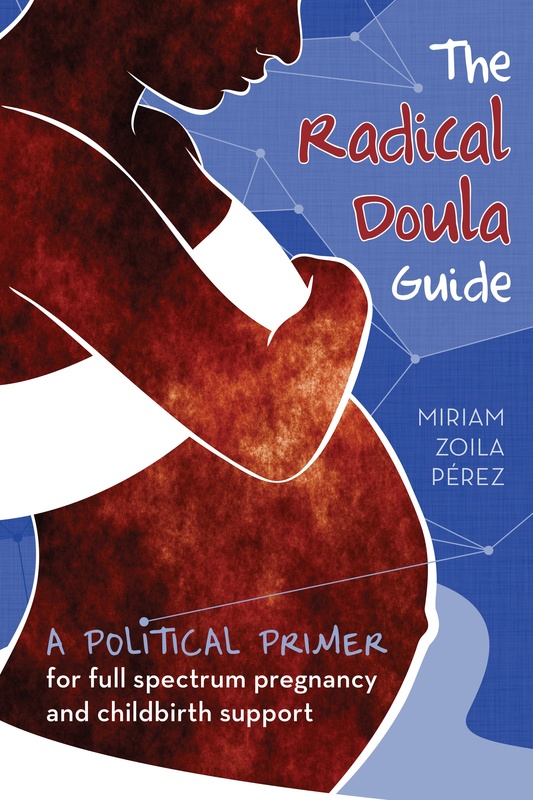 I love the term Radical Doula because it says so much in two short words. It suggests that we need to break out of the extremely limiting framework that is currently being used to discuss Reproductive Health and Justice AND it explains that my purpose is to play a supportive role in people’s lives as they explore their own truths, and the experiences they seek. I believe humans have had the stories of our lives highjacked and retold to us in terms that do not make us feel powerful or fully expressed. The experience of having a baby is PART of the story of a person’s life and what makes me a radical doula is that I think each person should allow their whole truth to be a part of how they make their choices. That means that abortion and adoption and all matters of reproductive health need to be honored and supported so that we don’t allow this splintering of our selves and our experiences. It is this splintering that has allowed these topics to become so political when truly, they are deeply personal and complex. I am a radical doula because I believe there is no universal truth and that people can and should be trusted to find their path, held up by professionals and loved ones, free from fear, shame and coercion. Under these conditions, the full spectrum of choices become legitimate and the power of the individual to live their own authentic life and tell their own story is restored. At the core of my doula philosophy is the belief that people make great choices for themselves when provided with accurate information, and appropriate support. Having a doula at your birth protects the agency of the parent/s to hold themselves at the center of their experience and make choices about their care that feel safe, confident and real. The more people we have recalling their birth stories positively, the easier it will be for future birthers to be free of the fears that so many people currently bring with them into pregnancy. The same is true for abortion and adoption. We need to prevent the harm of the past from having too much control over our perception and our future choices. I love how each client gives me an opportunity to grow through building the connection that becomes so useful when the “real work” starts. People are fascinating and coming into people’s lives during a time of change is both a privilege and a pleasure. I love to help my clients to decipher concerns and understand the personal and logistical landscape into which they are embarking. My work is never dull, and I love knowing that I have helped people to have more satisfying and empowering experiences.